as Steve Hardy in General Hospital, 1964. John Beradino (May 1, 1917 – May 19, 1996) was an American infielder in Major League Baseball and an actor. Known as Johnny Berardino during his baseball career, he was also credited during his acting career as John Berardino, John Baradino, John Barardino or John Barradino. 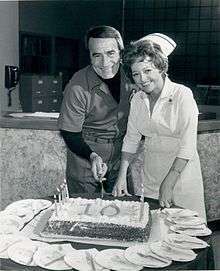 Publicity photo for the 10th Anniversary of General Hospital, 1973. Beradino was born Giovanni Berardino in Los Angeles. He grew up near Hollywood. Beradino attended Belmont High School, located in downtown Los Angeles. Beradino won a football scholarship to the University of Southern California in 1936. He soon switched to baseball. Beradino is often mentioned as having appeared in the silent Our Gang comedies produced by Hal Roach as a child actor but has not been identified as having appeared in any of the existing films. After attending the University of Southern California, where he played baseball under coach Sam Barry and was member of Phi Kappa Tau fraternity, Beradino was a major league player from 1939 to 1952, except for three years of military service in the U.S. Naval Reserve during World War II, from 1942 to 1945. He played second baseman and shortstop for the St. Louis Browns, Cleveland Indians, and Pittsburgh Pirates, winning the World Series with the Indians in 1948. He also played first and third base. After injuring his leg and being released by Pittsburgh in 1952, he retired from baseball and returned to acting, having appeared in his first film in 1948. Beradino appeared briefly in an uncredited role as a state trooper in the 1954 thriller Suddenly, starring Frank Sinatra and Sterling Hayden, and later performed as a policeman who allows Roger Thornhill (Cary Grant) to make a phone call to his mother in the 1959 Hitchcock thriller, North by Northwest. Beradino had a cameo role in the 1954 sci-fi thriller Them!. He also had a guest role in a 1956 episode of the television series, Adventures of Superman titled "The Unlucky Number". He played a small-time criminal who struggled with his life-style and wanted to reform. At that point he was still being billed as "John Berardino". Beradino appeared twice on the Western series Annie Oakley, with Gail Davis—as Gorman in "Annie Rides the Navajo Trail" and as Roscoe Barnes in "Amateur Outlaw" (both 1956). He appeared as one of the outlaws in the opening scenes of Budd Boetticher's "Seven Men From Now," with Randolph Scott, in 1956. He guest starred as well on John Bromfield's syndicated crime drama with a modern Western setting, Sheriff of Cochise, and Bromfield's successor series, U.S. Marshal. He was also cast in an episode of David Janssen's crime drama series Richard Diamond, Private Detective. Beradino played a minor gangster in The Untouchables pilot that originally aired in Westinghouse Desilu Playhouse. He then played a major recurring gangster, Augie Viale, in two episodes from the first season of The Untouchables series itself, "The Jake Lingle Killing" and "One Armed Bandits". On December 2, 1959, Beradino was cast as Al, a professional baseball player, in the episode, "The Third Strike" of the syndicated adventure series, Rescue 8, starring Jim Davis and Lang Jeffries. In the story line, the player loses consciousness when struck by a wild pitch and soon awakes with short-term amnesia. After appearing in more than a dozen B-movies, as well as supporting roles, as FBI agent Steve Daniels in the espionage series I Led Three Lives and as LAPD Sergeant Vince Cavelli in Leslie Nielson's The New Breed, he was offered the role of Dr. Steve Hardy on the soap opera General Hospital. Beradino also played a version of his General Hospital character on an episode of The Fresh Prince of Bel Air. For his contribution to the television industry, Beradino has a star on the Hollywood Walk of Fame at 6801 Hollywood Blvd. He has also been inducted into the University of Southern California Athletic Hall of Fame. He is the only person to have won a World Series (1948) and have his star on the Hollywood Walk of Fame (1993). Beradino received three Daytime Emmy Award nominations for best actor in a daytime drama. In tribute to the actor, General Hospital left Beradino's image with that of Rachel Ames in its opening sequence for a year-and-a-half after his death, through several updates. Though that image was finally removed in early 1998 (leaving Ames with a new solo image), an "action" clip of Beradino's Steve Hardy in the hospital remained in the sequence until the sequence's 2004 retirement. Beradino married Jeanette Nadine Barritt in 1941 and divorced in 1963. Together they had 2 children: Toni and Cindy. He married Marjorie Binder in 1971. Together they had 2 children: Katherine Ann and John Anthony. He played Hardy from General Hospital's inception in 1963 until becoming ill from pancreatic cancer in 1996. Beradino died on Sunday, May 19, 1996 in Los Angeles in his home. John and Marjorie Beradino, 1971. Film noir directed by Lewis Allen. Black-and-white science fiction monster film directed by Gordon Douglas. Spy thriller film directed by Alfred Hitchcock. Drama film directed by David Butler. 1982 Young Doctors in Love Soap Cameos Comedy film spoofing soap operas and directed by Gary Marshall. 1971 Do Not Fold, Spindle or Mutilate Det. Hallum Made-for-TV-Movie directed by Ted Post and the screenplay adapted by John D. F. Black from a novel of the same name by Doris Miles Disney. 1972 Moon of the Wolf Dr. Druten Gothic horror Made-for-TV-Movie directed by Daniel Petrie. 1978 A Guide for the Married Woman Doctor Made-for-TV-Movie directed by Hy Averback. Don't Look Back: The Story of Leroy 'Satchel' Paige Jake Wells Made-for-TV-Movie directed by Richard A. Colla and based on Leroy's autobiography, Don't Look Back : Satchel Paige in the Shadows of Baseball. 1 2 3 Oliver, Mynra (May 22, 1996). "John Beradino; 'General Hospital' Star". Los Angeles Times. Tribune Publishing. Retrieved April 24, 2016. 1 2 3 4 5 6 7 8 9 10 11 12 Grimes, William (May 22, 1996). "John Bernadino, 79, an Enduring Soap Opera Star". The New York Times. The New York Times Company. p. 21. Retrieved April 24, 2016. 1 2 Markusen, Bruce (August 26, 2011). "Cooperstown Confidential: Hollywood meets Mr. Boggs". Hard Ball Times. Retrieved April 24, 2016. ↑ "Baseball in Wartime.com". Baseball in Wartime. Retrieved April 24, 2016. ↑ SOD 2009, p. 67. ↑ "The Third Strike, Rescue 8, December 2, 1959". Internet Movie Data Base. Retrieved January 29, 2013. ↑ Kearney & Buchanan 1976, pp. 17–24, 53–55. ↑ DiGiacomo, Robert (July 16, 1996). "`General Hospital' To Pay Tribute To Member Of Original 1963 Cast Dr. Hardy Was A Stalwart Character On The Soap Opera For 33 Years.". Philadelphia Daily News. Interstate General Media. Retrieved April 24, 2016. ↑ Selby 1984, p. 184. ↑ "Suddenly". Turner Classic Movies. Retrieved April 24, 2016. ↑ "Them!". Turner Classic Movies. Retrieved April 24, 2016. ↑ "North by Northwest". Turner Classic Movies. Retrieved April 24, 2016. ↑ "The Right Approach". Turner Classic Movies. Retrieved April 24, 2016. ↑ "Young Doctors in Love". Turner Classic Movies. Retrieved April 24, 2016. ↑ "Do Not Fold, Spindle or Mutilate". Turner Classic Movies. Retrieved April 24, 2016. ↑ Disney, Dorris Miles (1970). Do Not Fold, Spindle or Mutilate. New York City: Doubleday. OCLC 98757. ↑ "Moon of the Wolf". Turner Classic Movies. Retrieved April 24, 2016. ↑ "A Guide for the Married Woman". Turner Classic Movies. Retrieved April 24, 2016. ↑ "Don't Look Back: The Story of Leroy 'Satchel' Paige". Turner Classic Movies. Retrieved April 24, 2016. ↑ Ribowsky, Mark (2000). Don't Look Back : Satchel Paige in the Shadows of Baseball. Cambridge, Massachusetts: Da Capo Press. ISBN 978-0306809637. SOD (February 24, 2009). "Athletic Support". Soap Opera Digest. United States. American Media. 34 (8): 67. Kearney, Patricia; Buchanan, Betty (January 1976). "The Story of ABC-TV's General Hospital (First Installment)". Daytime TV: 17–24, 53–55. Retrieved April 24, 2016. Selby, Spencer (1984). Dark City: The Film Noir. Jefferson, North Carolina: McFarland & Company. ISBN 978-0786404780. Wikimedia Commons has media related to John Beradino.